You may wish to see a page on the Acropolis of Fermo first. Fermo and Ascoli competed for supremacy from the very beginning of their long history. There were many fights between the inhabitants of the two towns, but their rivalry involved a non-military aspect too: the beauty of the town. 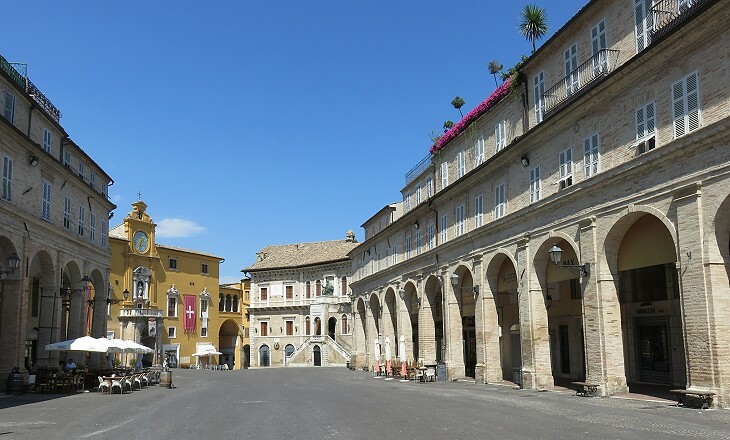 Ascoli stood on a large terrace between two streams and had two large piazzas, Fermo was built on the steep slope of a hill, but its inhabitants managed to level the ground of an area wide enough to house a monumental piazza. An interesting aspect of Piazza del Popolo is that it does not have a church, although it was designed in the second half of the XVIth century when it was directly ruled by the Papal Government. Another aspect one immediately notices is that it does not have a fountain, but it must be said that in many Italian historical piazzas fountains were added in the XIXth century. 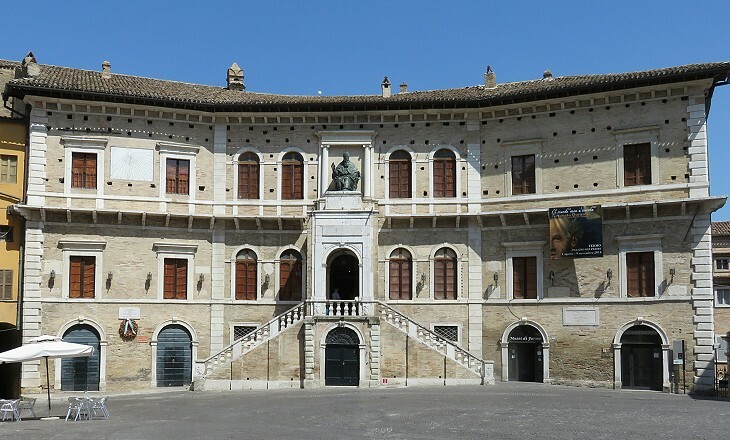 Palazzo dei Priori was completed in 1525 when Fermo was still in theory an independent town with its Priori, local magistrates in charge of the government. In reality it was ruled by members of local families who ruthlessly fought among themselves. Oliverotto da Fermo is known for having managed to become the sole ruler of the town by killing his own uncle and many noblemen during a banquet. In our times, during the rule of Alexander the Sixth, Oliverotto da Fermo, having been left an orphan many years before, was brought up by his maternal uncle, Giovanni Fogliani, and in the early days of his youth sent to fight under Paolo Vitelli, that, being trained under his discipline, he might attain some high position in the military profession. After Paolo died, he fought under his brother Vitellozzo, and in a very short time, being endowed with wit and a vigorous body and mind, he became the first man in his profession. But it appearing a paltry thing to serve under others, he resolved, with the aid of some citizens of Fermo, to whom the slavery of their country was dearer than its liberty, and with the help of the Vitelleschi, to seize Fermo. So he wrote to Giovanni Fogliani that, having been away from home for many years, he wished to visit him and his city, and in some measure to look upon his patrimony; and although he had not laboured to acquire anything except honour, yet, in order that the citizens should see he had not spent his time in vain, he desired to come honourably, so would be accompanied by one hundred horsemen, his friends and retainers; and he entreated Giovanni to arrange that he should be received honourably by the Fermians, all of which would be not only to his honour, but also to that of Giovanni himself, who had brought him up. Giovanni, therefore, did not fail in any attentions due to his nephew, and he caused him to be honourably received by the Fermians, and he lodged him in his own house, where, having passed some days, and having arranged what was necessary for his wicked designs, Oliverotto gave a solemn banquet to which he invited Giovanni Fogliani and the chiefs of Fermo. When the viands and all the other entertainments that are usual in such banquets were finished, Oliverotto artfully began certain grave discourses, speaking of the greatness of Pope Alexander and his son Cesare, and of their enterprises, to which discourse Giovanni and others answered; but he rose at once, saying that such matters ought to be discussed in a more private place, and he betook himself to a chamber, whither Giovanni and the rest of the citizens went in after him. No sooner were they seated than soldiers issued from secret places and slaughtered Giovanni and the rest. After these murders Oliverotto, mounted on horseback, rode up and down the town and besieged the chief magistrate in the palace, so that in fear the people were forced to obey him, and to form a government, of which he made himself the prince. So the whole party entered Sinigalia, dismounted at the duke's quarters (those of Cesare Borgia aka Duke Valentino), and went with him into a secret chamber, where the duke made them prisoners; he then mounted on horseback, and issued orders that the men of Oliverotto and the Orsini should be stripped of their arms. Those of Oliverotto, being at hand, were quickly settled, but those of the Orsini and Vitelli, being at a distance, and having a presentiment of the destruction of their masters, had time to prepare themselves, and bearing in mind the valour and discipline of the Orsinian and Vitellian houses, they stood together against the hostile forces of the country and saved themselves. But the duke's soldiers, not being content with having pillaged the men of Oliverotto, began to sack Sinigalia, and if the duke had not repressed this outrage by killing some of them they would have completely sacked it. Night having come and the tumult being silenced, the duke prepared to kill Vitellozzo and Oliverotto; he led them into a room and caused them to be strangled. Neither of them used words in keeping with their past lives: Vitellozzo prayed that he might ask of the pope full pardon for his sins; Oliverotto cringed and laid the blame for all injuries against the duke on Vitellozzo. In 1538 Pope Paul III put an end to the independence of Fermo, similar to what he did two years later at Camerino. 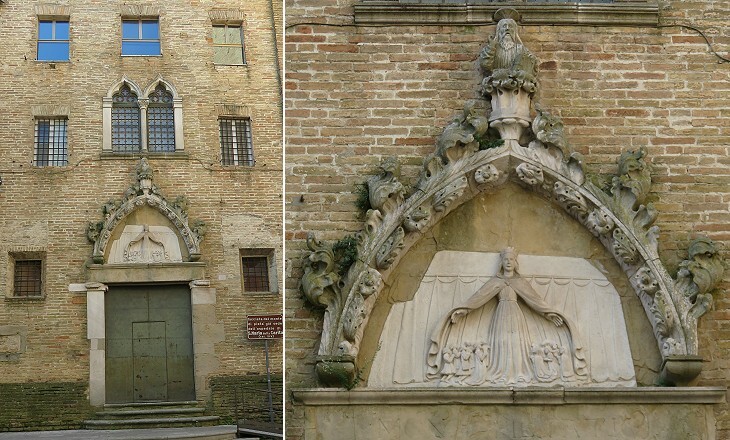 In 1589 Pope Sixtus V, Bishop of Fermo in 1571-1577 made the town the capital of an ecclesiastical province. Its Archbishop was given a supervisory role over the Bishops of Ascoli, Camerino, Macerata and other minor dioceses. The town was ruled by a representative of the Cardinal Nepote, the nephew to whom most popes gave the supervision of state affairs. In the XVIIIth century, after this practice had been discontinued by Pope Innocent XII, the Archbishop became the ruler of the town with the title of Prince. His palace was redesigned in 1741. It adjoins Palazzo dei Priori (the Town Hall) so that he could quickly switch roles. The University of Fermo was founded in 1398 by Pope Boniface IX and in 1585 Pope Sixtus V promoted its development after a long period of decline. In the following years, Girolamo Rainaldi, a leading Roman architect, designed a new building in order to visually show the new importance given to the institution. 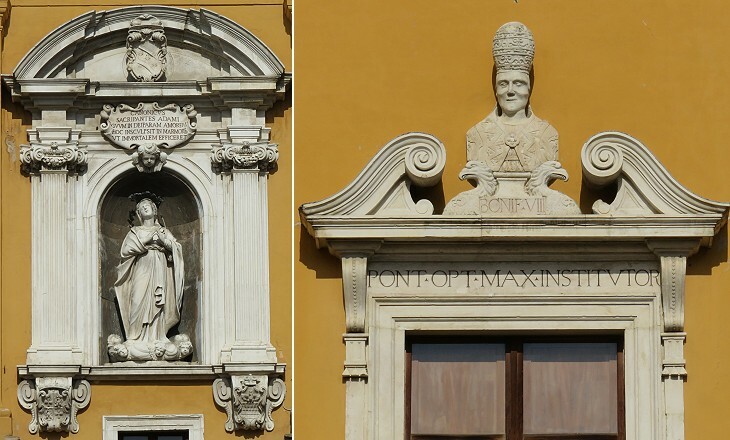 In the XVIth century it was wrongly believed that the University had been founded by Pope Boniface VIII, who was therefore celebrated with an (ugly) bust on one of the windows. The Tribunal of Fermo had jurisdiction on the dioceses reporting to the Archbishop on important matters which were not delegated to the local tribunals. Law was therefore the most important faculty of the University, similar to what occurred at La Sapienza, the University of Rome, the church of which was dedicated to St. Yves, patron saint of the lawyers. Legislation in the Papal State was very complex. The best students graduated in utroque iure i.e. in both civil and canon law. 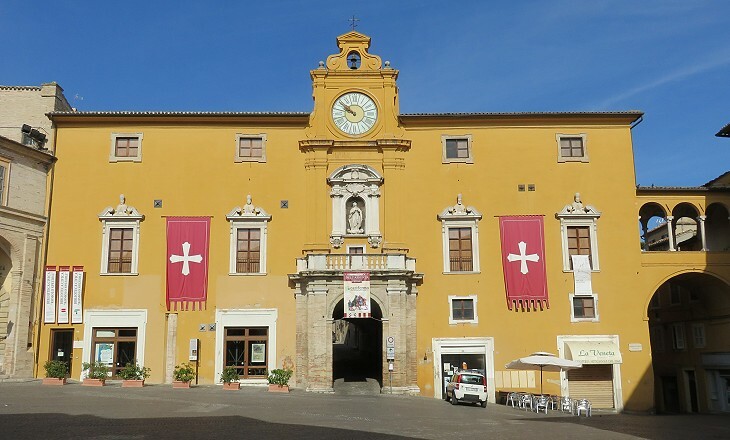 When the positions of Archbishop and of ruler of the town were not yet united, papal envoys resided in a palace at the southern end of the piazza. 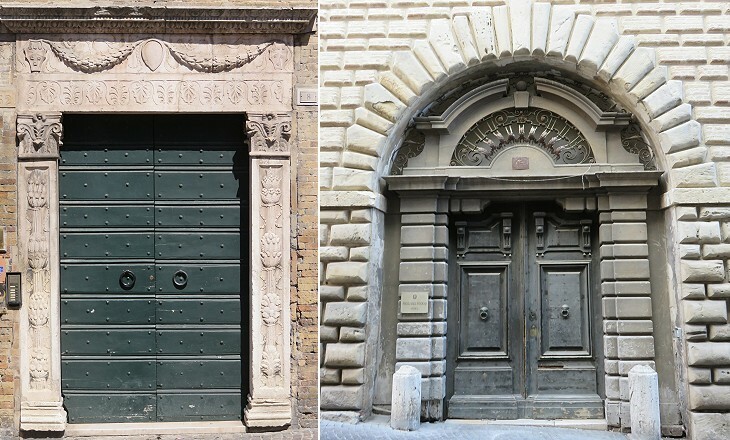 Its construction began in the early XVIth century and it was completed by Pope Gregory XIII with the addition of a very Roman-style portal with two ancient columns. The loggia on the side of a (lost) hospital dedicated to St. Roch completes this overview of the monuments decorating the piazza. It was built in 1528 at the end of a pestilence, similar to what occurred at Matelica. The saint was specially invoked against the plague. From Piazza del Popolo a short passage goes down to a street which crosses most of the town on the northern side of the hill. Many of the noble families of Fermo had their palaces along this street which is almost interrupted by the high tower of the Matteucci, a family of warlords. Saporoso Matteucci fought with the Venetians against the Ottomans. In 1542 he captured a ship carrying Mihrimah, the daughter of Sultan Suleyman, who lived in this tower for a few months, before being released in an exchange of prisoners. A small statue/relief celebrates the death of Rinaldo da Monteverde: he became the ruler of Fermo in 1376 with the help of the Republic of Florence, at the time in open war against Pope Gregory XI. 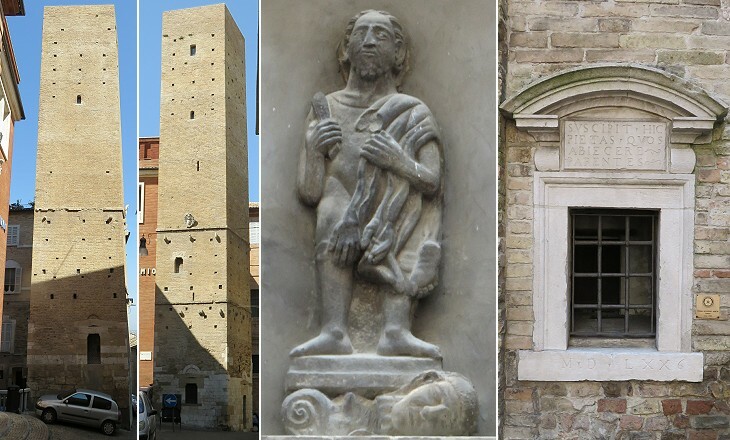 His tyranny was resented by the citizens of Fermo who rebelled on St. Bartholomew's day (August 24, 1379). He fled to the fortress of Girfalco and then escaped from the town. He was eventually captured and executed at Fermo. Suscipit hic Pietas quos abiecere parentes (Here Piety helps those who were abandoned by their parents), the inscription on the foundling wheel states its purpose. Abandoned children were usually given surnames such as Esposti or Innocenti which indicated their origin. Their first name was usually that of the saint whose feast fell on the day they were found. Giacomo di Giorgio is recorded as a sculptor from Dalmatia. He followed the steps of Giorgio da Sebenico aka Giorgio Orsini, who in addition to designing the Cathedral of Sebenico extensively worked at Ancona. The relief is very similar to one at S. Maria della Misericordia in Ancona. In 1655 Queen Christina set her residence in Rome after having abdicated the throne of Sweden. Pope Alexander VII asked Cardinal Decio Azzolino from Fermo to assist the Queen and to introduce her to the Roman society. He was the grand-nephew of another cardinal by the same name who had been the private secretary of Pope Sixtus V. He became a close friend of the Queen and helped her in financial matters and in the selection of works of art for her collection. Christina named him her sole heir, but he died two months after her in June 1689. His nephew inherited the art collection. Many paintings and drawings were sold and they are now in France, Scotland and the Netherlands. 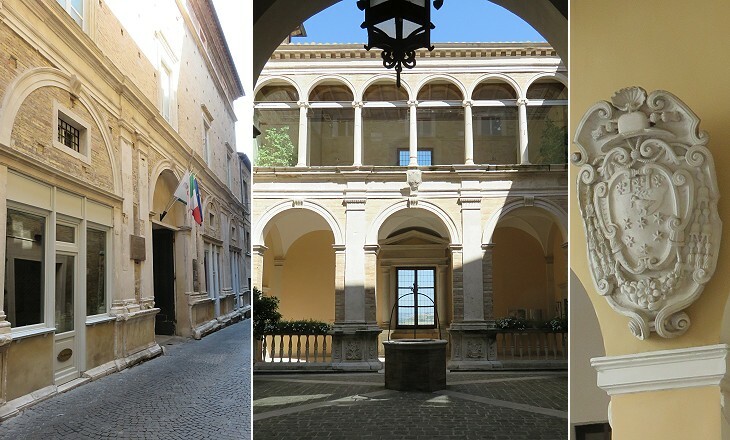 The palace at Fermo was bought by Cardinal Azzolino. It had been designed by Antonio da Sangallo the Younger for the Rosati family. 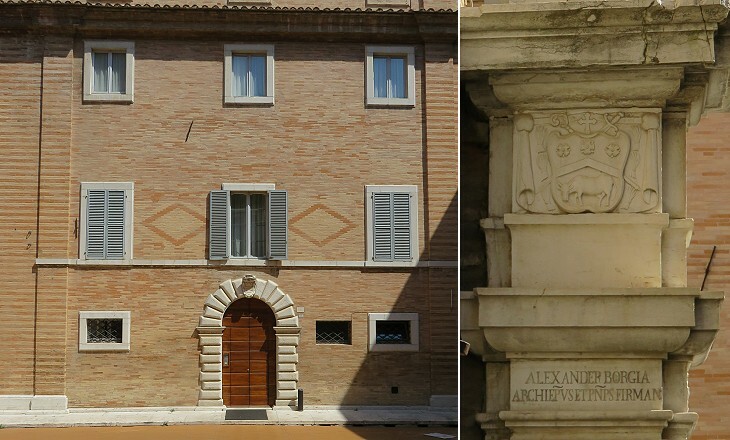 Antonio da Sangallo the Younger was involved in the design of Palazzo Vitali and Palazzo Rosati Azzolino when he visited Fermo to inspect its fortification on behalf of Pope Paul III, who was worried about the defence of Rome and the Papal State. 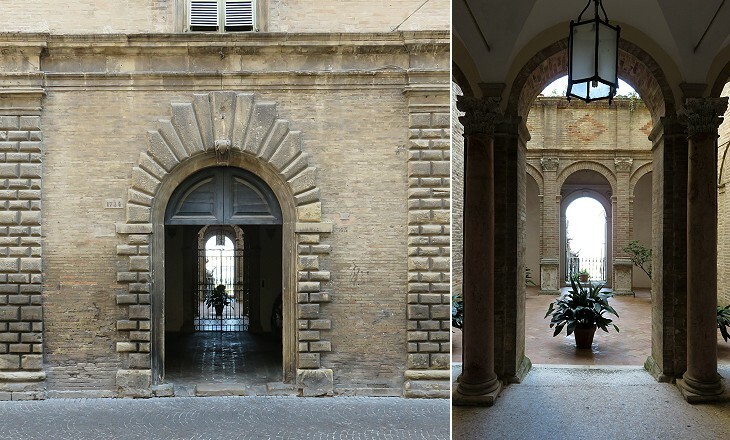 In the design of Palazzo Vitali Sangallo had to take into account already existing buildings belonging to the Vitali, but he managed to give the palace a Renaissance appearance in particular by placing two ancient columns from the Theatre at the entrance to the courtyard. The windows of Palazzo Fogliani reflect the influence of Venetian Gothic architecture, but the portal is typical of the Early Renaissance and is similar to that of Canonica di S. Michele. 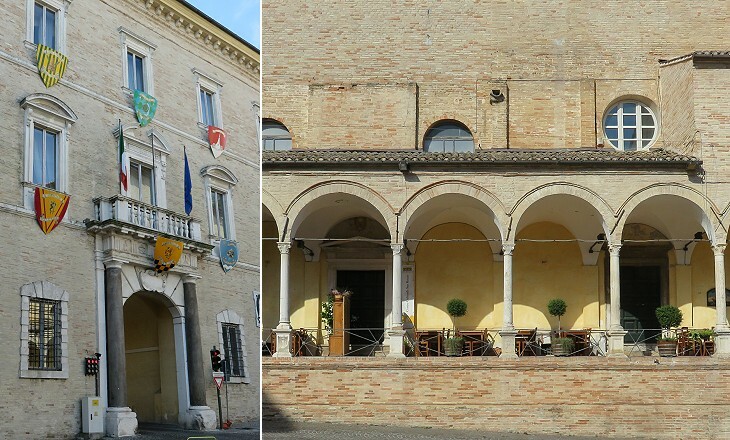 This is not the palace where the banquet given by Oliverotto da Fermo took place, but it is not without gruesome memories: the heads of two young relatives of Oliverotto's uncle were hung above the portal. The Paccaroni are recorded as a rich and pious family of bankers in XIIIth century Fermo. They managed to increase their wealth and power and acquire the title of Conte. They held important positions in the administration of Fermo during the Papal rule, the French occupation and after the town became part of the Kingdom of Italy. Return to The Acropolis or move to The Lower Town.